Turkey Hunting: Afternoon or Not? Where legal, afternoon hunting can be one of the most exciting and effective ways to tag big gobblers. Many hunters are out if the woods or do not afternoon hunt, meaning that you tend to have your hunting turf to yourself. Coupled with the fact that many hens have left the gobblers, it can be a deadly time to hunt. However, as noted above many states do not allow afternoon hunting, so we decided ask two hunters on different ends of the afternoon spectrum their thoughts on afternoon hunting. Both hunters gave their pros and cons on the matter. Alabama is where I do the majority of my hunting, and as long as I have been chasing longbeards, it has been legal to afternoon hunt in Alabama. For me personally, afternoon hunting is one of my favorite times to hunt, simply because I kill at least one or two turkeys a year in the afternoon, and because I hold the belief that if you can strike a turkey in the afternoon you stand a much greater chance of killing him than in the morning. 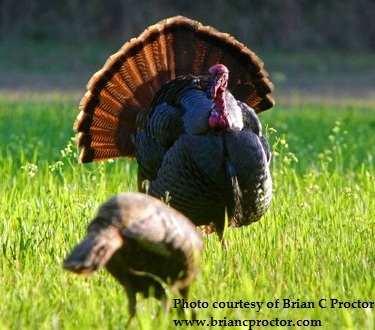 Most afternoon gobblers are flying stag, and respond quickly to the call, if you are able to provoke a gobble. Many afternoon hunts I have had been textbook "flash hunts" that have lasted mere minutes between the time I set up and when the turkey was flopping. Depending on what phase I feel the turkeys are in, I will be aggressive and cover a lot of ground, or will take a more coy approach and will either glass fields or set up and blind call in an area turkeys frequent, which is my less preferred method. The fact that turkeys do not regularly gobble in the afternoon makes simply striking a turkey better than fishing or sitting back at the camp. There are several arguments to afternoon hunting that get passed around. First, afternoon hunting does add to the amount of pressure a property receives, and yes, you do tend to bump turkeys from time to time that haven't answered your calls. Because of this, I try to line up places that may not be my "ace in the hole" spots to take the pressure off the tracts of land I do the majority of my morning hunting. These tracts may hold fewer turkeys, but my justification is that if I do happen to spook some turkeys there, they will have more time to rest than if it were a place I would want to hunt the following morning. The second argument against afternoon hunting that people pose is a biological one but tied to pressure. Some biologists feel the added pressure that afternoon hunting presents can disrupt a hens' nesting activities and thus lead to higher predation via the hens being bumped off her nest by afternoon hunters. So really, but arguments are directly tied to pressure, but I am not sure the cost outweighs the benefit. Afternoon hunting is a joy and I am thankful we are allowed to do so in my home state. Now before you start reading, know this about me. I have never hunted afternoon...I mean literally after 12:00 pm. In my home state of New York, we have to call it a day at noon. My knowledge of hunting after the noon whistle is very little, other than what I have seen on videos and TV but it seems to me the morning hunt is the way to go. There is just something about the morning; the rays of sunshine filtering from the horizon and illuminating turkey country in front of you. There is something about a long beard "ripping air" in the low light of the morning, announcing his presence and challenging the day! There is something about being set up or setting up on a roosted bird under the cover of darkness. The morning hunt just has something about it that oozes turkey hunting. When people think of turkey hunting they think of morning hunting! There are a few reasons why morning hunting is something I enjoy. Some are hunting related and others are biological reasons. The biological reason is that it is believed by biologist that hunters afield in the afternoon might bump hens off their nest, which could possible disrupt their nest and leave the nest susceptible to predators. This would ultimately hurt turkey populations. The state also believes that not allowing hunters afield in the afternoon will help reduce the accidental shooting of hens which will hurt nesting and overall populations. These are the beliefs of my home state; they are currently in the midst of re-evaluating the current Wild Turkey Management Plan study. In terms of hunting I think having the hunters call it a day at 12 noon, helps keep the pressure off the birds we love to hunt. This allows them to fall back into their patterns in the afternoon and hopefully be back where they started that morning. Personally, one of my favorite things to do is roost birds, when I say roost birds I like to know exactly what tree they are in! I love getting in tight well before light and enjoy hearing the spring woods wake up, it is unlike anything I have ever heard. A hunter can greatly increase his odds of success when getting in tight to a roosted gobbler. Using the cover of darkness to set up on a gobbler is something that an afternoon hunter doesn’t enjoy. This could allow you to get in tight as I mentioned or to get set up in a field where a gobbler may spend his day. Getting set up in that field wouldn’t be possible if the birds could see you, obviously. Morning hunting doesn’t necessarily limit the hunter to just a single morning set-up. Once birds have hit the ground and if your “roost set-up” didn’t pan out, you can use the rest of the morning to run and gun. The only difference between a hunter done at noon running and gunning versus a hunter that has all day is, the hunter done at noon better have done his scouting to maximize his time afield. This friends, is a turkey hunter, one that awakes and with stealth positions himself in the woods to await dawn and a gobbling turkey. What are your thoughts on afternoon hunting? Weigh in below!